Parkinson’s Disease (PD) patients have a five-fold greater risk of carrying genetic mutations in the β-glucocerebrosidase gene (GBA), which are commonly associated with Gaucher disease (GD). Patients with both PD and GD tend to experience earlier onset of PD and more serious cognitive changes than PD patients without the mutations. A new study published in the Journal of Parkinson’s Disease suggests that GD or the presence of GBA mutations may actually shield patients from deficiency in visual color discrimination, which is a hallmark of PD. “Consistent with previous studies, color discrimination was decreased in patients with PD. However, this study introduces new findings that relate to the impact of GD in the context of PD-related color discrimination. These findings may imply a ‘protective effect’ on color discrimination in those GD patients who also have PD, which probably is due to a sensory mechanism rather than a cognitive effect,” explained lead investigator Deborah Elstein, PhD, of the Gaucher Clinic at Shaare Zedek Medical Center Jerusalem (Israel), which is the largest clinic of its kind, devoted solely to Gaucher disease patients. This group, spearheaded by Prof. Ari Zimran, the Director of the Gaucher Clinic, was the first to publish anecdotal evidence of the association between GD and early-onset PD. The investigators tested groups of patients on a color visual discrimination test known as the Farnsworth-Munsell 100 hue test (FMHT) and calculated their mean Total Error Scores (TES). In the FMHT, patients are asked to arrange colored caps so that there is a gradual transition in color between two anchor caps of different colors. Better performance is indicated by lower TES scores. The groups consisted of 10 patients each, classified by PD only, GD only, both PD and GD, carriers of the GBA mutations, GBA carriers with PD or healthy controls. GBA carriers were thought to have one mutation whereas those with GD have two mutations. Looking at the mean number of errors on the FMHT, the GD only group made the least number of errors (mean 129.70), fewer errors than even the healthy controls (mean 177.70). The PD only group made the most number of errors (mean 289.70), more than twice the number made by those with GD only, confirming that PD patients manifest poor color discrimination. Patients with both GD and PD made the second highest number of errors (mean 237.90), followed by those who were GBA carriers with PD (220.20). 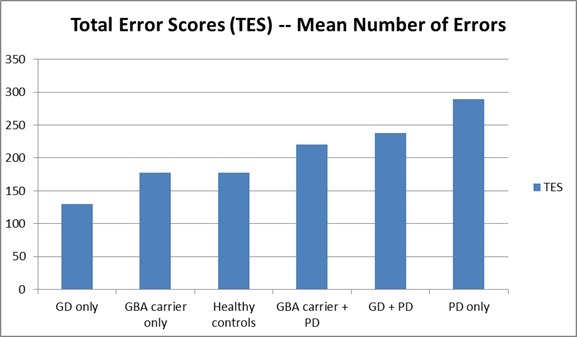 GBA carriers without PD made more errors (177.20) than those with GD only, which was approximately the same number of errors as healthy controls. Overall, patients with PD displayed worse visual color discrimination compared to those without PD. Caption: Mean number of errors on the FMHT by patient group. “The seminal finding of lowest TES (fewest errors) among patients with GD only (also relative to the healthy persons) was unexpected,” stated Dr. Elstein. She also noted with interest that patients with GD (with or without PD) had lower TES than GBA carriers (with or without PD). These findings strengthen the evidence linking PD and GD. For instance, a small proportion of patients with GD, and an even higher proportion of their relatives who are carriers of GD, display symptoms of parkinsonism. Other studies have found that having one or two mutations of the GBA gene is a risk factor for PD, while PD patients have a greater than anticipated frequency of GBA mutations. GBA-associated PD is characterized by an early onset accompanied by severe cognitive impairment, and “generally these patients suffer more often and more severely from a variety of non-motor symptoms such as neuropsychiatric complaints and autonomic impairment,” commented Dr. Elstein. Gaucher disease is the most common genetic disease affecting Ashkenazi Jewish people who originated primarily from Eastern Europe. According to the National Gaucher Foundation (www.guacherdisease.org), the disease has an incidence of about 1 in 20,000 live births, rendering it the most prevalent lysosomal storage disorder (a term referring to a group of disorders affecting enzymes that regulate metabolism which are located in cell lysosomes). “Color Discrimination in Patients with Gaucher Disease and Parkinson Disease,” by Shlomi Simon-Tov, Tama Dinur, Nir Giladi, Anat Bar-Shira, Mayaan Zelis, Ari Zimran, and Deborah Elstein (DOI 10.3233/JPD-150585), Journal of Parkinson’s Disease, Volume 5, Issue 3 (2015). To obtain the full text of this study and additional information contact Daphne Watrin, IOS Press, at +31 20 688 3355, d.watrin@iospress.nl for additional information. Journalists wishing to interview Dr. Deborah Elstein may contact her directly at debby.elstein@gmail.com.